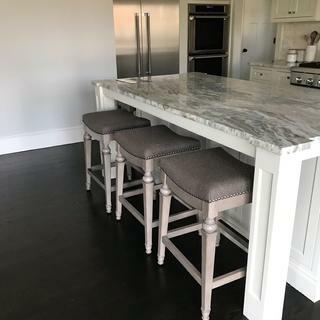 Blending on-trend styling with elements of traditional charm, this Vetrina 26" Counter Stool adds a distinct appeal to your home bar setting. Set in rustic light-brown finish, this transitional-style stool features ornately detailed tapered feet and burnishing nailhead trim accents. It comes with a fabric-upholstered cushioned seat in a subdued posture for your seating comfort. Comment: Price may vary based on option(s) selected. Seat Height: 26"
Extremely comfortable, very sturdy and well made. It is a high quality and very comfortable counter stool. Highly recommended. 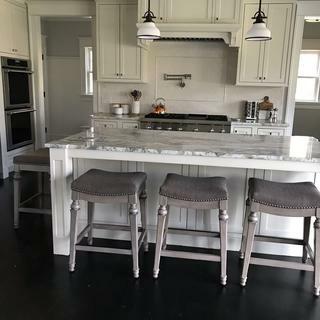 I have been looking everywhere for the right stools to fit at my kitchen island. I was looking for comfort, height and design. These stools check all of those boxes. When starting my search I had no idea how extremely costly stools would be. I've looked everywhere and finally settled on these. They are beautiful but at $1000+ they should be. The quality is great and they are exactly what I was looking for minus the price.